Perhaps you were tricked into it. Maybe you’re doing it for a dare. It might be a bucket list goal checked off or the next step in your coxing career or even a last-minute stand-in because nobody else was available. Whatever your reasons for coxing the Tideway for the first time, the chances are you’re feeling a bit daunted. And with good reason. The Tideway is a magnificent beast, but she must be approached with caution. Her moods are unpredictable and she can turn on you in an instant, going from calm and serene one moment to raging and lashing the next. Having survived my first ever experience of coxing the Tideway yesterday, I’m here to give you my top tips. Let me start, though, by telling you what this won’t be about – just, you know, for the avoidance of doubt. This isn’t about steering the perfect line, about second lamp-posts from the right or the two-thirds-one-third rule. It won’t tell you about the best calls or the most convenient clubs to boat from. Those matters are dealt with more thoroughly and with much more expertise than I can offer by Proper Elite Coxes who genuinely know their stuff; you’ll find them quickly if you google “coxing the Tideway” (make the 12-minute official minute video your starting point, but be sure to watch others, too; it gets quite addictive). No, this is about the stuff you only find out about when you’ve done it for the first time and still understand how scary it is to be a newbie. The weather forecast can be deceptive. Remember what I said about the Tideway being unpredictable? That. So despite my weather app telling me it was a mild, dry day with a light breeze, the reality was that I was coxing the Tideway in what the Vets’ Head laughingly called “frisky conditions”. What this actually meant was a nasty, stiff wind blowing against the flow which meant that it was bumpy and lumpy and we had waves breaking over the boat. And then, just to mess with my head, on the way back the wind dropped, the water went glassy and the sun came out (again, not predicted by my app) and I wished I’d brought my factor 50 (I caught the sun). So basically, bring kit for every eventuality. Pack more layers than you think you’ll need, and if you’re not a local, ask a cox at your host club what they’re planning to wear. Bring sunnies even if it is cloudy, and wet weather kit even if they’re predicting sunshine. You can leave stuff at your host club if you’ve overdone it. You’ll almost certainly need wellies or flipflops for boating and think about what you’ll wear on your feet in the boat (not wellies, obviously). I put Sealskinz socks on over walking socks and that worked well, but it wasn’t a terribly cold day. On top of that, bring your notes, your race plan and a map of the course if you don’t by now have it firmly committed to memory (useful for last minute revision). 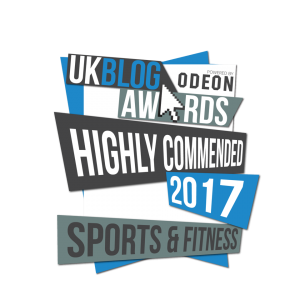 Pop in your usual coxing paraphernalia (I keep meaning to blog about what I bring to every event – remind me!!) plus (I know it’s obvious, but it’s easy to get so distracted that you forget the basics) your cox box, life jacket and charger. Pack snacks and food for the day, unless you’re happy to rely on your host club, plus a bit of cash. Don’t forget your phone – and remember to put the Race Control number into your favourites. All of this, including my wellies, fitted into a standard overnight bag. 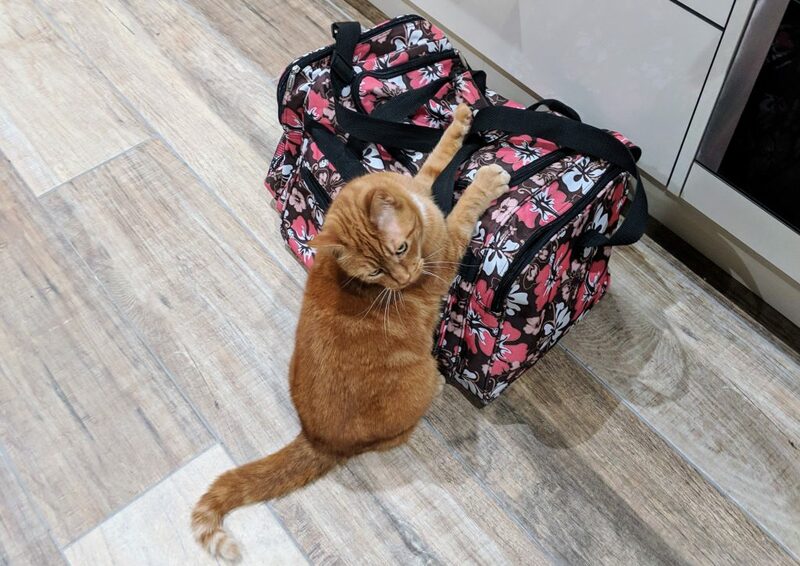 Here is Cyrus, my enormous cat, showing you how big the bag was. Because I’m nice like that, I brought flapjacks for the crew and Prosecco for afterwards (a bit of a club tradition), which filled another bag (partly because, being a perfectionist, I also brought picnic fizz glasses) but I guess that’s not essential. Finally, when I was travelling and rigging I wore my new favourite item of kit, my dryrobe, which I’ll tell you about in a later post. It’s looking set to become a must-have for me. Don’t forget, all this kit may affect your transport arrangements. I wouldn’t have fancied lugging all of that on the Tube. It can all get a bit stressy out there. No matter how well you steer the boat, at some point you’re bound to have someone yelling at you. On the whole I found the marshals to be genuinely helpful (though I’m still smarting at the 10-second penalty we got for our boat missing its ID number following a recent repaint – I’d been ticked off on the water and had reported it back to the club, so assumed that would be the end of it, but hey). The officials do genuinely want to get everyone safely down the course and have to make themselves heard, and it can come across as more aggressive that it’s intended to be. I found that a smile and a wave was usually returned. Above all, acknowledge their instructions and warnings by raising your hand briefly, so they know you’re on the case – communication needs to be a two-way thing. 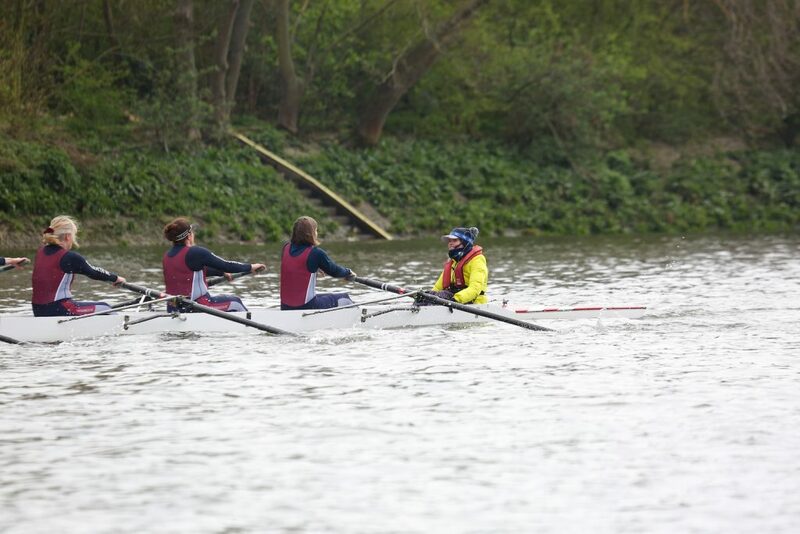 Keep your head if other crews are aggressive – and they may well be, however friendly they are off the water. When you’re marshalling, communicate with other coxes and be nice to everyone. They all just want to get up to the start in the right order and on time, and they may be nervous themselves, so give everyone the benefit of the doubt. You may well encounter some attitude during the race, too. I was probably too easily pushed about on the start, where the marshals started us closer together than was comfortable, which put me in a spot right from the beginning, but by the second half of the race I was starting to hold my own a bit better. Every guide to coxing the Tideway mentions it, and it was top of my list of Things To Remember. To my great frustration, though, I came uncomfortably close to the black buoy (not even black, as you can see) – close enough to bring me out in a sweat, thanks to another crew that pushed me over and over and wouldn’t give me enough room to pass. Gratifyingly, they got a massive telling-off from the marshall (and from me – by this time I’d found my voice) and I moved back into position in time. Another lesson learned. Phew. Your job doesn’t end at the finish line. Unless you’re boating from somewhere near the finish, you’ll have to row a fair way after the race when everyone is exhausted. Good preparation makes a massive difference. A crew can get horribly demoralised and weary as the adrenaline wears off, especially if they didn’t have the best race. I told my crew that there was to be absolutely no sightseeing on the way down, but that they could look at the landmarks to their hearts’ content on the way back (we boated from Putney Town, right by the start). We did different things at different landmarks on the return, so for example as we passed Chiswick Eyot I got them to sharpen up their catches and do a mini-push. 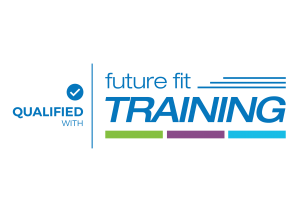 Decide in advance how you’ll get everyone rehydrated, refuelled and reclothed. I dropped them out in pairs and sometimes in fours when it got snarled up, which it often did. You may find your crew is a bit crazy and unfocused, and you still need everyone to keep their wits about them on the return journey, so think about some easy drills. You can do these when it’s all a bit stop-start in the busy parts – maybe roll-ups or pause rowing. It’ll help pass the time, too. Finally, I blethered on a lot and tried to keep them laughing (often at my expense – hey I’ve no pride) for the four long miles back to the club. I’m sure by the end of it they were heartily sick of the sound of my voice. Even I was. Whether you had a great race and won a coveted pennant or came last in your category (cough), you should encourage your crew to celebrate. As I said to my ladies before we set off, they already deserved a pat on the back just for getting to the start line – for doing all that training and having the guts to enter the race. It’s a heck of an achievement racing on the championship course, even if things don’t quite go as planned. 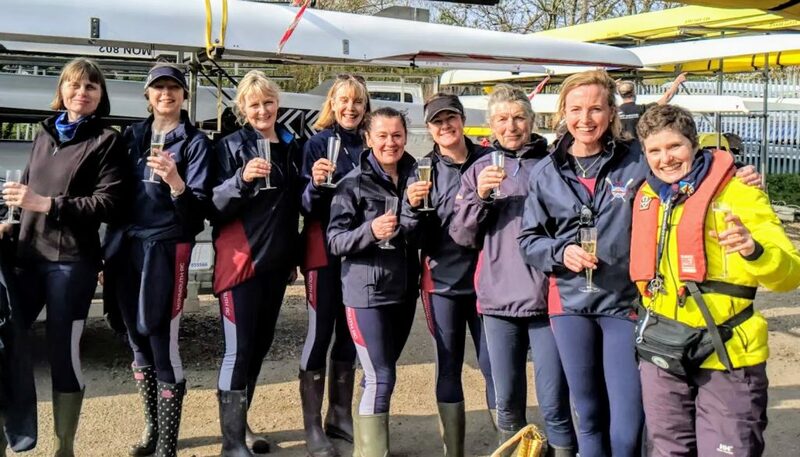 And being brave enough to cox the race and take responsibility for a boat and a crew on such a challenging course is reason alone to celebrate, whether your line was perfect or a zig-zaggy muddle. And then there’s the aftermath. It’s easy for what you thought was a great race to turn instantly into a disaster when the results come through or you see the photos (or, worse, video footage). Don’t beat yourself up (I’m the worst offender here, so I’m telling myself this as much as you). By all means, learn from your mistakes but try to keep it constructive. So there you have it, my survivor’s guide. 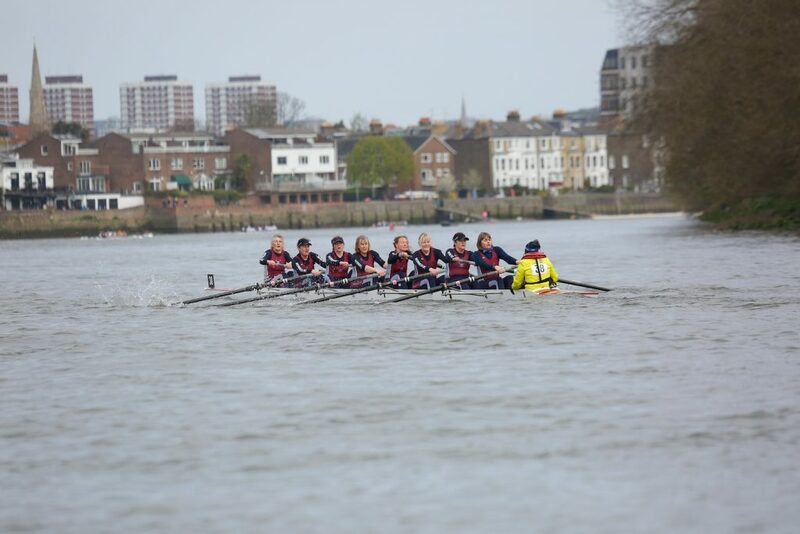 What are your top tips for coxing the Tideway? I’d love to know. What a great write up ! I would not be able to cox a race on the tideway so huge congrats!!! Thank you! Trying not to beat myself up over my mistakes! No mistakes, just learning opportunities! You did brilliantly, and it was good to meet you at last! Thank you – and ditto! Still faintly traumatised by it all, to be honest!! Tideway a real challenge but it teaches you so much. Well done for giving it a go. 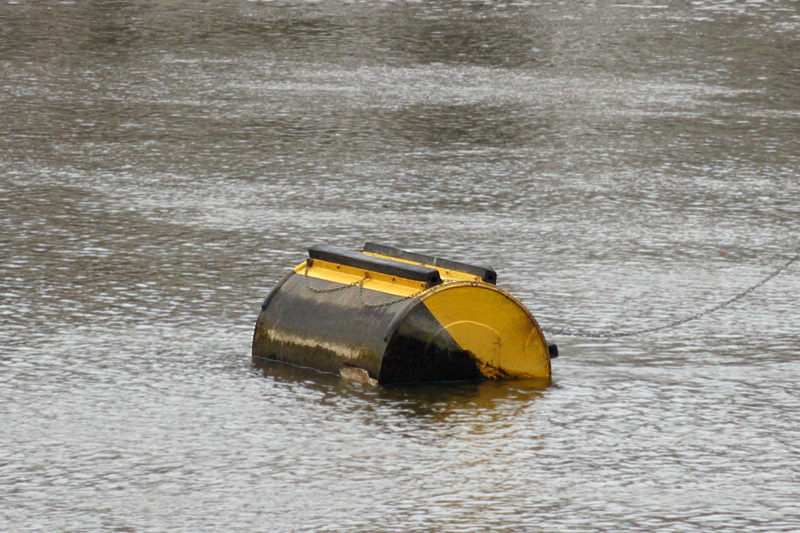 One more bit i’d add to your list of tips: do not bend/break the fin when boating on tideway. This might sound stupid, but that’s one thing coxes who are used to boating from floating landing stages forget. And then you’re stuck at best with a bent fin and struggling to steer the entire course or wore yet without a fin at all and unable to race. Now if you do bend it, it is actually possible to straighten it back up somewhat even in the boat while marshalling (as I discovered this year) but it will still cost the crew a lot of speed in the race, and believe me you will be blaming yourself for every single of those lost seconds. Crikey, yes, definitely one to avoid! Thanks for reminding us! Or you end up putting an s bend in the fin in an attempt to straighten it!…. Don’t worry we borrowed a fin for the vets head but the boat is back on the rack finless! It is SO EASILY Done! There was a tell tale scraping sound as we were coming off the water after racing but no damage done, deep fins are a pain on the tideway! Ah, don’t you just hate that sound?! Thanks so much, Annie. Tideway a bit of a challenge compared with our peaceful river Wye! Sorry for getting quite so close up your arse at the start but once we pushed on at Chiswick Bridge I didn’t want to slow down! Should have left a bigger gap earlier Soz Hun! We managed to make a close acquaintance with a red navigation buoy by Harrods due to a combination of overtaking crews and the stonking crosswind. So the fact you made it to the finish and back to PTRC unscathed is better than us! It was great to see you and Mary,have a great summer! Oh, no worries. You did what you had to do! In my ignorance I had assumed the marshalls would send us off one by one like they do in other head races – hadn’t realised until an experienced cox told me later that there is even strategy in the timing and manner of your turn before you set off. So much to learn. So yeah, pretty pleased to have got us all back in one piece. And particularly proud of managing to make them laugh on the return journey!